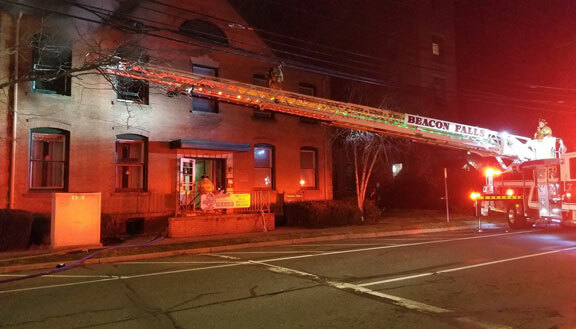 BEACON FALLS — A fire that started after a vacuum cleaner ignited quickly spread through an apartment on North Main Street late Monday night. Firefighters responded to a report of an appliance fire in a second-floor apartment at 8 North Main St. at about 10:30 p.m. When firefighters arrived on the scene, Beacon Hose Company No. 1 Fire Chief Brian DeGeorge said a room and its contents in the apartment were on fire. Firefighters attacked the fire from inside while using a ladder truck the town purchased this year to ventilate the building, DeGeorge said. Firefighters knocked down the fire, which had started to spread to a small crawlspace above the apartment, in about 20 minutes, he said. “It was under control quickly. It could have been worse without the quick actions of the first responding crew,” DeGeorge said. Crews remained on the scene until about 1:30 a.m., he said. Beacon Falls Fire Marshal Keith Griffin said the cause of the fire was determined to be an accident. Griffin said the man who lives in the apartment where the fire started was working on motors for mobile robots. While he was vacuuming up magnesium shavings, Griffin said, the vacuum cleaner short-circuited and a spark ignited the shavings. The man unsuccessfully tried to put the fire out himself, Griffin said. At one point, Griffin said, the man put the vacuum cleaner in the bathtub and poured water on it, which caused the fire to flare up because water doesn’t extinguish magnesium fires. The man was transported to the hospital for smoke inhalation. No other injuries were reported. The building at 8 North Main St. is known as the Counting House building of Beacon Mill Village, an apartment complex that is separate but close to the building. There are three apartments and a hair salon in the building, according to DeGeorge. The building also houses telecommunications equipment for Frontier Communications. One of the apartments is vacant, DeGeorge said, and the resident who lives in the other apartment got out when the fire alarm sounded. Griffin said the apartment where the fire started is totaled. Other areas of the building suffered smoke and water damage. Griffin said the two residents living in the building have been displaced for now, while the hair salon was open by Wednesday morning. Water damaged Frontier’s telecommunications equipment, causing interruption of video, telephone and internet services to some customers. The services were coming back online Tuesday night, according to Emily Tantare, senior public relations consultant with Frontier Communications. Monday marked the first time Beacon Hose used Truck 6, the ladder truck, at a structure fire. Before the company had Truck 6, firefighters relied on mutual aid from surrounding towns to provide a ladder truck. DeGeorge said having the truck allowed firefighters to attack the fire quicker, since they could ventilate the building using the ladder. The truck also provided a secondary egress for firefighters inside the building, he said. Beacon Hose received mutual aid from Citizens’ Engine Co. No. 2 and Oxford Center Volunteer Fire Company. Editor’s note: This story has been updated from the original post to include new information. Really, second floor and couldn’t use a normal ladder? It sure would be quicker to setup. I love how they rub the new ladder truck in your face. What a waste of money.